Hello everyone! 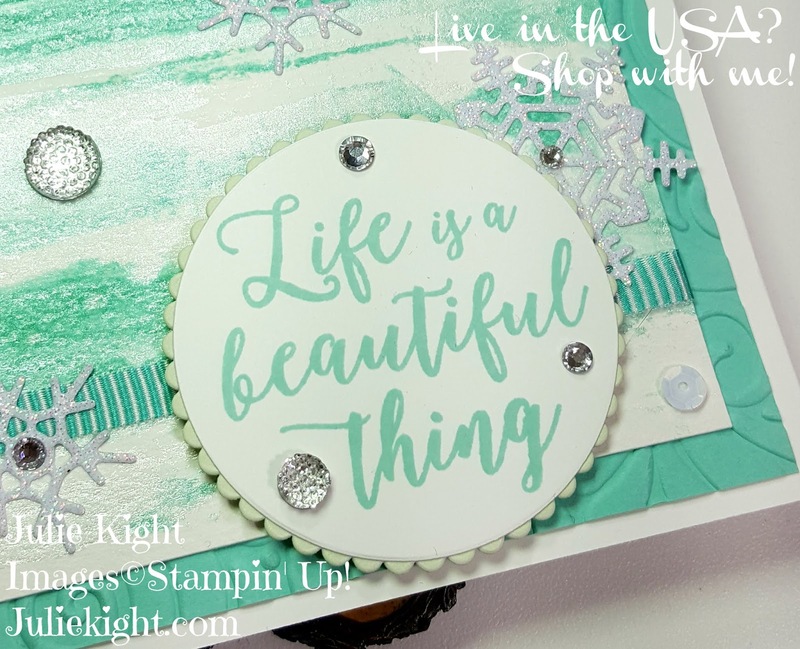 I'm Julie Kight and welcome to my blog. How is your week so far? Today for you I have a special treat...a blog hop! 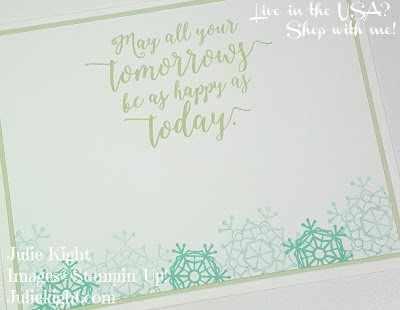 I am part of a special training group for Stampin' Up! demonstrators run by Kylie and Bruno Bertucci from Australia. They are such an amazing husband and wife team! For this blog hop I wanted something for the season and I had just seen this cool technique done by another demonstrator and wanted to try it myself. 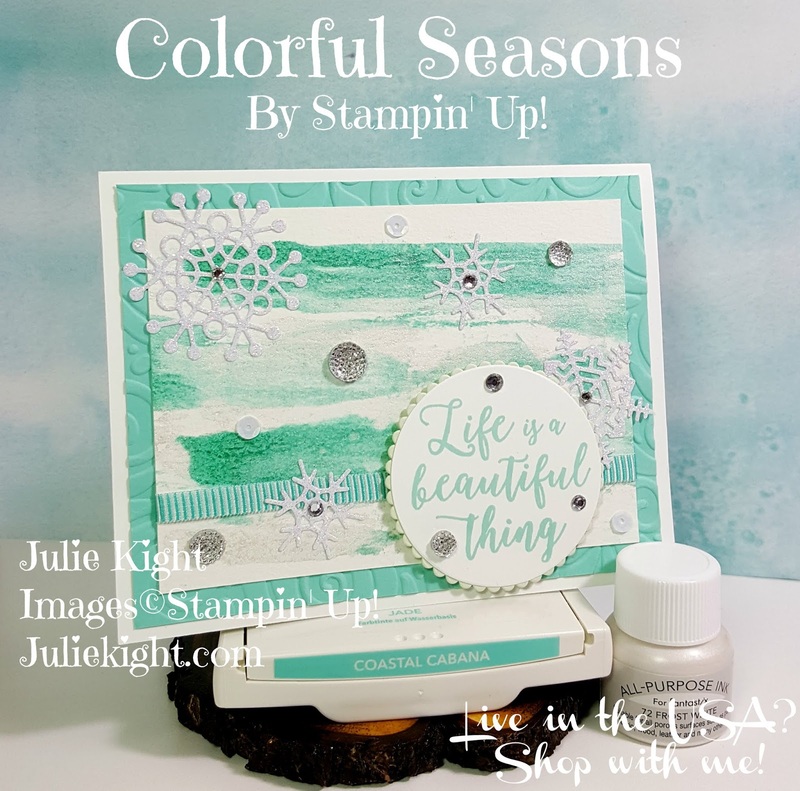 The Colorful Seasons stamp set and Seasonal Thinlits are so versatile as they can be used for any season as there are stamps and dies for each one. To do the inking technique I used the Coastal Cabana reinker and the new Shimmer Paint from the Holiday Catalog. I dropped four drops of the paint on a piece of Watercolor Paper down one side and then I dropped one drop of the reinker on two of those paint drops. Then I took an old credit card and swiped across dragging the drops. I used some of the Sparkle Glimmer paper to make the snowflakes. They look so pretty against the shimmer of the paint. It is kind of hard to photograph how much it shines. I used a piece of Coastal Cabana cardstock embossed with the Swirls & Curls TIEF for some extra texture. I used a cute sentiment to go along with the theme because when it snows I think the world is absolutely beautiful. I also added a bunch of clear embellishments and some white sequins. They really make the card sparkle more. I also used a piece of the Bermuda Bay Mini Striped ribbon across the card. 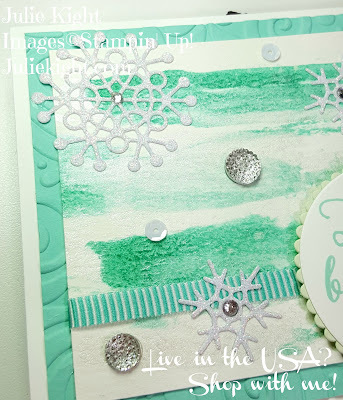 Here is the inside of my card and I carried the snowflakes in here as well. I also layered a piece of Soft Sea Foam for some added color. If you would like to order anything I used here today, just click on the items below. Thanks for looking! Here is the list of all the individuals participating in the blog hop. If you get lost at anytime just click on the next name.